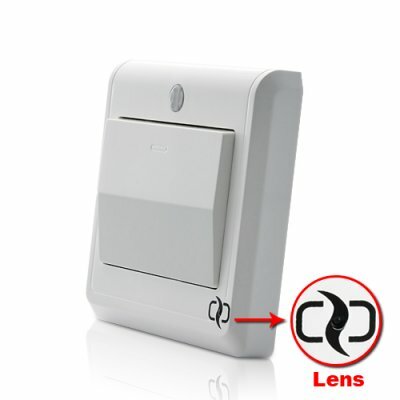 Successfully Added HD Camera Light Switch with GSM Remote Control (Motion Detection, MMS Alert) to your Shopping Cart. Camera Light Switch with GSM Remote Control - record people standing where they shouldn't be and get alerts in live on your phone! This wall mountable light switch looks and works just like an ordinary light switch, but inside is a high resolution camera, whose tiny pinhole lens is perfectly hidden. It is one of the most inconspicuous products available on the market! Being totally undetectable it still secretly records great videos and takes ultra-detailed photos. In other words this awesome hidden camera is capable of capturing the fine details such as skin tone, eye color and facial features with the clarity you would expect from a full-size surveillance camera. The most outstanding part of this device is that it can be operated from your phone. Choose video or photo modes by SMS and receive alerts on your mobile phone as soon as intruders are detected! How is it possible? Simply insert a SIM card inside the switch, set it to transfer information directly to your phone once there is any move and then receive a clear MMS when it actually happens. If you are being robbed it will help you react quickly and call the police in time to catch the thieves in action. Enjoy your life worry-free thanks to this wonderful light switch: even if you chill at the other side of the planet drinking coconut juice on a white sand beach with crystal water, keep secretly watching your place in live! Make sure you order now while supplies still last! All this is brought to you by the online leader of high-tech gadgets, Chinavasion. It can be charged by outlet. It can be used to turn on light.